The saguaro cactus (carnegia gigantia) is one of the most widely recognized symbols of the Southwest, and is found across a large area of Arizona, from the vicinity of Kingman in the northwest to Benson and Safford in the southeast, across to Yuma in the southwest. Within this area are some flat, sandy regions where the plant is absent, since it prefers rocky soils with good drainage, but otherwise it grows in most habitats, from the low deserts to mountain slopes up to 4,500 feet elevation. 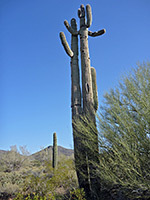 The saguaro is moderately frost tolerant, but the factor preventing its colonization of other desert areas is the requirement for summer rainfall, provided in Arizona during the monsoon season, from July to September; for this reason the saguaro is not found in south California, which lies outside the normal course of the moist summer air moving northwards from the Gulf of Mexico. The only exceptions are a few sheltered groves in the mountains of the far southeast, including the Chuckwalla and Whipple ranges. The cactus is the most prominent plant in several Arizona national preserves (Saguaro, Organ Pipe Cactus, Ironwood Forest, Sonoran Desert, Kofa, Cabeza Prieta) and is also used extensively as a landscaping plant in cities and private gardens. The range continues into Mexico, in the west of the country, as far south as Ciudad Obregón. Young saguaro resemble some of the ferocactus species but they are easily identified once mature, when they grow to heights of 30 feet or more and take on the familiar branched appearance. The first side arm appears after around 60 years, and a large specimen may have several dozen branches. Large, white, yellow-centered flowers bloom late spring, lasting for several weeks, followed, in summer by reddish fruits. In rare cases, the tip of the cactus becomes distorted, producing fan-like growths (cristate). Several species of wildlife have evolved to take advantage of the saguaro including the Gila woodpecker which creates cavities in the stem, and the elf owl which nests in the holes. Plants may live for several centuries, being killed by fire, frost, rot, or after toppling over.